It’s Sunday night as I post this; I came back in the afternoon from what I could describe as a ‘weekend away in the Lake District’, but that doesn’t really sum it up very well. Actually I have just spent two days walking, through weather that could best be described as ‘mixed’ (see tomorrow’s post). I have bagged 9 – more than a quarter – of the fells remaining on my project and now have only 23 to go. 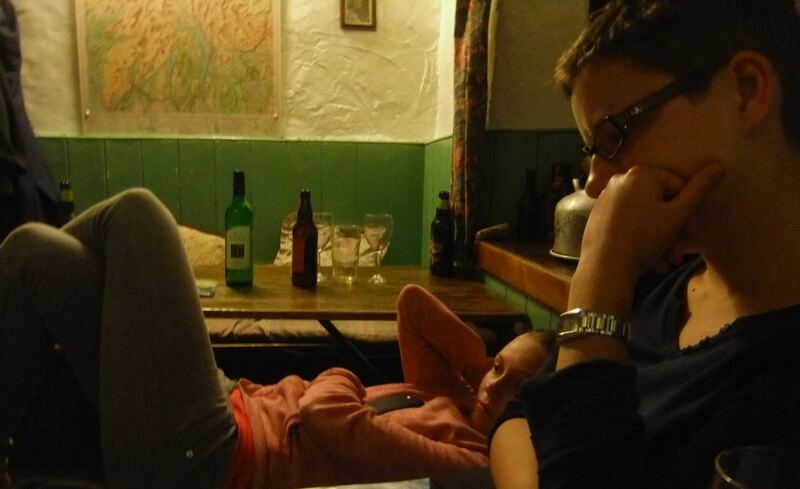 I broke the journey at the Black Sail youth hostel. Located at the head of the valley of Ennerdale, this is some two miles’ walk from the nearest other building, let alone road. It sleeps about 20 people and was about two-thirds full on Saturday night. It’s a great oasis in the hills. And it serves beer. These two were part of a group who worked in Edinburgh and were all parasitology researchers, or something. They drank wine with me and we played Yahtzee (Lisa, lying down in this picture, won) and we and the other guests could just forget the rain outside for a little while.